Hospitality refers to the relationship between a provider and their guest. 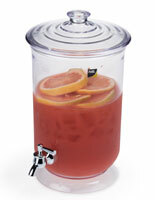 Cater to your guest's needs with one of these buffet drink dispensers. Featuring professional-quality materials with upscale designs, the choices are many with prices ranging from $20 to well over $200. 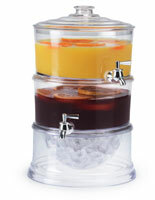 Our buffet drink dispensers are sized from one to three gallons and are designed to hold fruit juice, iced tea, flavored water, and other beverages that need to be served chilled. 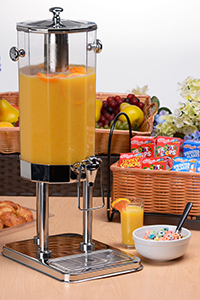 The economy drink stations are more geared for informal gatherings while the chrome-plated stainless steel models add considerable style to wedding receptions, continental breakfast spreads, and other catered events. As with any public use, the purpose of these hospitality fixtures is to provide sanitary dispensing while maintaining a neat and tidy appearance. 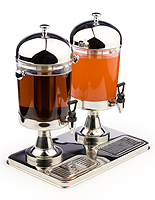 What features do these cold beverage stations offer? 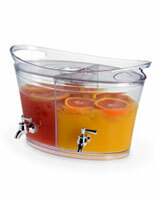 Buffet drink dispensers less than $40 primarily come with an all-plastic construction. 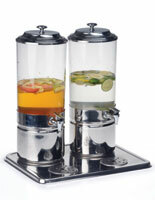 Able to dispense one or two different liquids depending on the model, the containers feature traditional spigots for guests to help themselves. A couple styles will need to be elevated on a riser or shelf top in order to provide space to place a cup underneath the spigot. 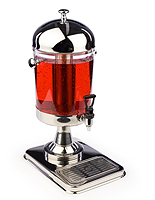 More expensive cold beverage stations have elevated stands constructed from stainless steel and boast highly polished chrome finishes. 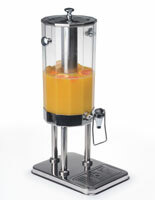 Appearance-wise, these dispensers offer professional quality and styling absolutely perfect for catering businesses. The canisters are made with polycarbonate, a shatter-resistant plastic that is also crystal-clear. Additionally, internal ice cores store ice to chill the liquid without diluting it, while drip trays catch any unwanted spills. For hospitality and catering providers, offering guests with fresh chilled beverages is an important part of any buffet or cafeteria spread. Maintaining clean dispensers is too, so all of our models break down for effortless cleanup.